FWT Ltd specialize in the design, installation and maintenance of boreholes, ground source heat pumps, private water supplies, water pumps and water analysis and treatment. We are a small company with an organic ethos, our team of highly experienced engineers provide a comprehensive installation and maintenance service. 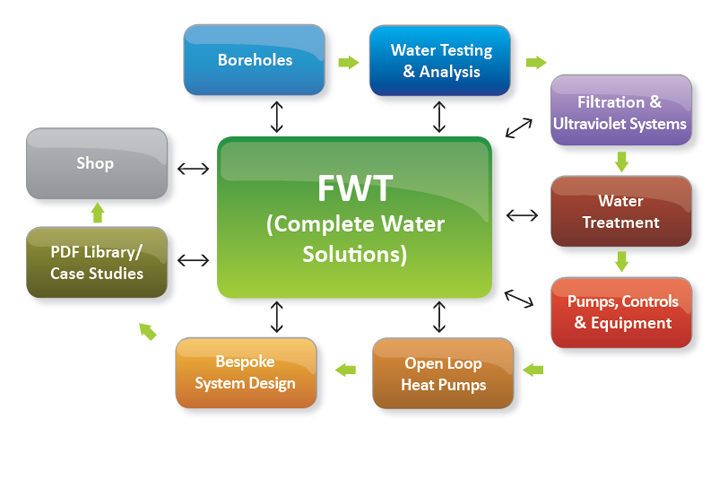 FWT offer solutions to water problems. We can provide a wide variety of services relating to water supplies and ground source heat pumps to both the domestic and light commercial sector. From installation and maintenance of ultraviolet units or water softeners to the design and installation of borehole, spring catchment and ground source heat pump systems. Our bespoke systems are designed and installed to the highest standards ensuring they meet all your requirements and conform to the latest private water supply regulations. FWT offer a borehole camera inspection service to check the integrity of the borehole liner. We also install, service and maintain water softeners, iron and manganese removal units, pH correction units and offer a full range of water testing services.